A REPORT forecasting a tough Brexit outcome for Shetlanders vindicates remaining in the EU, according to local SNP politicians. The report by the People’s Vote campaign, drawn up from research by the London School of Economics, indicates Shetlanders will be £483 per head worse off under a hard Brexit, and £241 worse off if access to the single market is kept. Shetland will be hit worse than either Orkney or the Western Isles, according to the report, but is expected to be much better off than Aberdeen city, where inhabitants are forecast to lose £1,776 under hard a Brexit and £1,008 if a “soft” Brexit is negotiated. According to SNP Shetland convenor Iain Malcolmson the figures are “illustrative” of what a hard Brexit would mean for people in Shetland. Realistically, this meant having another Scottish referendum as Conservative leaders had ruled out having a second referendum on leaving Europe, he said. Malcolmson said that the SNP’s “Brexitometer”, that had been deployed at the three recent agricultural shows, demonstrated a clear swing to Scottish independence and against the UK leaving the EU. SNP councillor Robbie MacGregor added: “These figures do not surprise me and demonstrate how foolish the whole concept of Brexit is. “A large majority in Shetland and Scotland voted to remain in the EU and we now find ourselves being dragged out against our wishes. “We were told in the independence referendum to vote Yes would result in us leaving the EU and in the Europe referendum there would be huge financial benefits to the country. Alas empty promises. “I believe the time has come for a second referendum on independence which would remove us from this fracas”. 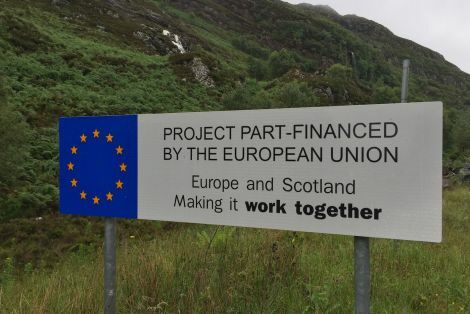 According to the People’s Vote, promises of a post Brexit bonanza or economic boost are very wide off the mark and “bad news for householders in Scotland already struggling with higher interest rates, inflation and stagnant wages”, who voted by a majority of two to one to remain part of the EU. Leading supporter of the People’s Vote, Labour MP Ian Murray said: “This dramatic study shows the reality and costs of Brexit to everybody in the Shetland Islands. “Crashing out of the EU on destructive terms is going to hit the pockets of many Scots for a long time to come. “It will especially impact key sectors like our world class universities, financial services and food and drink. But Shetland MSP Tavish Scott paid scant heed to the figures which, he said, would be near impossible to calculate. He said that there would be “no doubt” a cost to leaving the EU, but the local fishing sector, which was worth £300m, was convinced it would be better off leaving the Common Fisheries Policy. This had to be balanced against any negative effect for Shetland as a whole, he said.